Joyce W Cairns (b 1947) is one of the UK’s most significant artists. Based for many years in the village of Footdee, beside Aberdeen harbour, and now by the River Tay, Dundee, Cairns’ distinctive and humane work feels more relevant than ever in a “post-truth” world. Our complicity in world events and the need for personal reconciliation with the past are powerful themes throughout her work. Cairns’ paintings, drawings and original prints are full of psychological intensity and emotional charge, tackling subjects of humanity, war and collective memory. She is a masterful draughtswoman, creating dreamlike, figurative compositions that reflect the complexity of human experience. Cairns’ extraordinary body of work, including her War Tourist series, reveals her ability to convey the resilience of ordinary lives in the face of internal and external conflict. 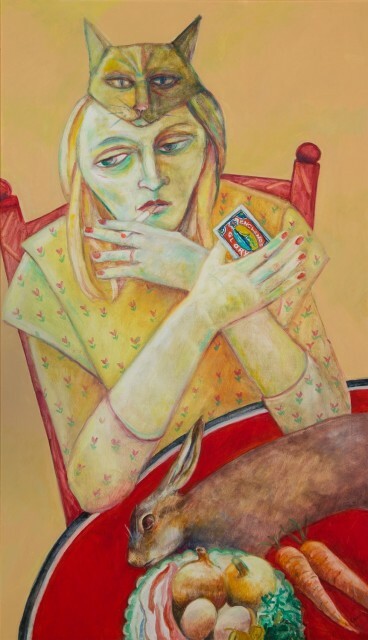 Inspired by German Art of the Weimar period including Max Beckmann, George Grosz and Otto Dix, Cairns’ uncompromising vision and acute sensitivity sets her apart. Joyce W Cairns PRSA. RSW. Hon RBA. MA (RCA) studied painting at Grays School of Art, Aberdeen and the Royal College of Art, London.